Need an idea on what to cook for dinner tonight? Here is yet another delicious chicken dish. This time stewed in a red wine sauce, with mushrooms, bacon and peas. You can serve it with home made French Fries, Rice or even Pasta. Fry the chicken pieces in pan with a drizzle of olive oil until golden. Remove from the pan, throw in the onions, sauté for a few minutes and then add the bacon and garlic to the pan. Put the chicken back in, sprinkle a tablespoon of GF flour and stir the chicken pieces to coat it with flour. Season with salt and pepper. 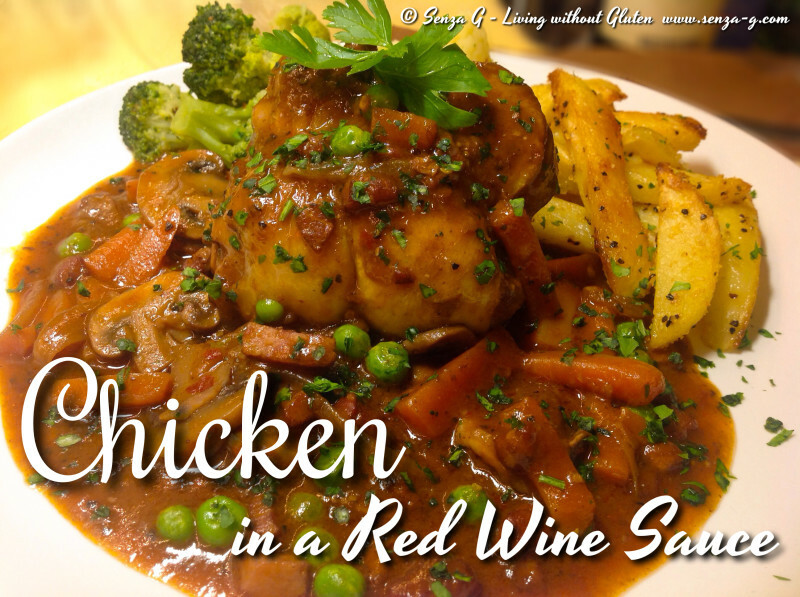 Pour in the chicken stock, the red wine, sliced mushrooms and the carrots. Add also the spices and tomato paste. Cover and let simmer for 1 hour. Add the frozen peas. Remove the lid and cook over medium heat for the last 20 minutes. The sauce should reduce to concentrate the flavors. Sprinkle with chopped parsley before serving.